Low resolution is great. It saves CPU power, especially with the collision code I talk about in this article, and it makes it easier to work with the project (like when building huge rooms or making edits to sprites). You’ll see that sometimes there’s little to no reason to scale up your sprites. It’s just a waste of resources. 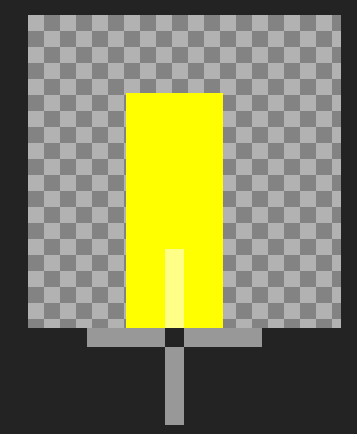 With the collision code I use objects move by whole pixels. This makes for perfect collisions but it usually leads to jittery movements. Luckily there’s a simple solution. This is the most practical collision code I ever came across on the web. I read about it some time ago on Zack Bell‘s blog and I subsequently adapted it slightly to suit my needs. It basically remains the go-to code for 2D low res platformers. It’s like… unbeatable. Think holy grail of platformer movement and collision. I’m using the following hierarchy. You can use a different hierarchy for your collisions, just adapt the scr_platformer_move code. I’m using fall through platforms so I use the obj_solid_top. This script must be called from the create event of your active/moving objects. This code should run at the end of your movement velocities calculations. Ideally at the end of your object’s step event (normal step event is fine). It’s of fundamental importance that you take extra care when dealing with collision masks. Make sure they behave the expected way especially when flipping your objects around. Most of the times the error lies in the origin or in the symmetry of a mask. Here’s a sample of a wrong collision mask. Counter intuitively I placed the origin in the exact middle of the mask. It will result in asymmetric mask behavior when mirroring it (i.e. when turning left or right in the game). This mask will create collision issues and probably get objects stuck inside walls or slopes. It took me a while to understand how the origin pointer looks and behaves. This is a centered, symmetric collision mask… I’ll be honest: it absolutely doesn’t look like that to me. But trust me, this is the right one. Let's fix the jittery movement! Disable the automatic drawing of the application surface. Resize the application surface to the correct, hi resolution size. Draw our sprites with sub-pixel offsets. Draw the stretched application surface manually in a post_draw event. Can you see what’s going on here? 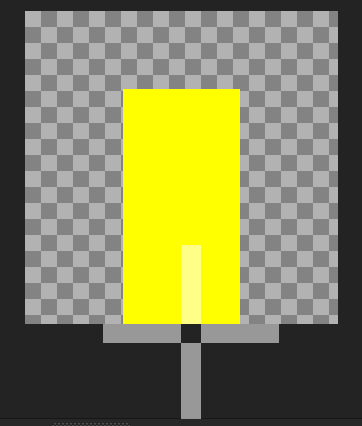 Objects still move by whole pixels. Their collisions are still being calculated for whole numbers only. Still, we draw the sprites with sub-pixel precision! The loops for collision checks have to run for very low numbers/distances. This means ultra-smooth movement, ultra high performances and very low disk/ram resource usage (compared to up-scaled pixel art). If you download the attached project you’ll see how I solved the slopes jittery movement. I’m using simple trigonometry to find the Y position given the X position on a slope. I’m still using whole pixels to compute collisions but I use the following snippet just to draw the sprite of the player. This system might not be perfect and I’m open to new solutions. Let me know if you have a better system to obtain smooth movements using low resolution assets.